Pontus Snibb is one of those musicians who likes to be busy. He's got his main job as frontman of Bonafide, he's a member of Jason and the Scorchers, and has now decided that two bands aren't enough to keep him busy so has decided to make a solo album. His solo album is a blues album. Since Bonafide does have quite a noticeable blues element in it's music this shouldn't come as a surprise. Whereas Bonafide is a rock band with a blues influence, this album is more the opposite - blues with elements of rock, and it's a damn good album. At the HRH blues festival last month despite being one of the first bands of the day, he still managed to pull one of the biggest crowds of the weekend, helped no doubt by fans of Bonafide coming to check his Blues show out, but the fact that the place was full throughout his set suggests that people liked what they heard. It's a great album - Pontus's voice is gritty and carries plenty of emotion, and the guitar sound is great. There's a nice mix of songs too - from the slow "Longing for you" to the faster paced "Keep on loving me" or "Same same". 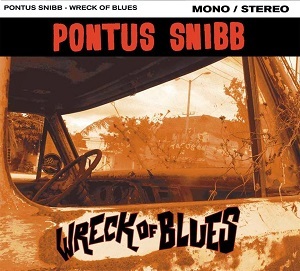 The album opens with the first single - "More blues and blue sounds". It's a great choice as the single - check out the video below and hear what it sounds like for yourself. This is definitely a great album. There's great guitar work and the vocals work really well. At times it reminds me of early ZZ Top albums when they had more of a blues sound. It's definitely an album well worth checking out.